I am immensely proud that the Banque et Caisse d'Epargne de l'Etat Luxembourg now hosts a private permanent exhibition of my work in the newly renovated ARBED building, 19 Liberté. The private exhibition, which is exclusively accessible to BCEE employees, covers a whole floor with 24 of my photographs made in Luxembourg. All artworks are gorgeous acrylic glass prints and some of them have a size of up to 180 by 90 centimetres. Many of the pictures that have been acquired by the BCEE are among my most popular works. Most of these pictures have already been acquired as art prints by private collectors, but this is the first time that I have printed so many large acrylic glass prints that are on display in a single location. 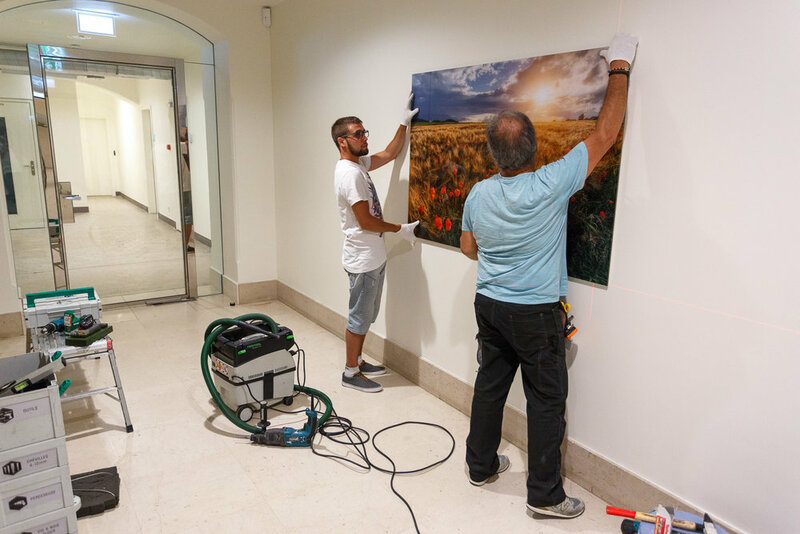 Among the largest artworks that have been printed for this exhibition, you will find City in Motion, which is the largest print I have made up to this point with its 180 by 90 centimetres. Other large prints include Cherry on Top, which displays the Grund behind a beautiful blooming tree, Treasure Tower, which shows the BCEE tower in front of a gorgeous sunset, and The Fabled City, one of my favourite winter pictures made in Luxembourg City. There is also a selection of Luxembourg's countryside with such pictures as Water Realm, which displays the Mullerthal's Schiessentumpel, Beaufort Castle, which is self-explanatory, and Splash of Red, which is one of my most recent creations of red poppies in a wheat field. As an artist, I struggle and strive to create unique photographs of this city and country I fell in love with. The ARBED is such a prestigious building and a testimony to Luxembourg's history. Having so many of my beloved pictures displayed in this place gives me an immense sense of pride and fulfilment. I am truly grateful that I have been given the opportunity to add a small mark of myself to this historic landmark. In 2015 the ARBED building was purchased by the Banque et Caisse d'Epargne de l'Etat. Since then the building has been completely refurbished to host new office spaces for the bank. It was inaugurated very recently and is now named 19 Liberté. It is quite impressive how much work there actually is behind the making of an exhibition such as this one. I consider myself a perfectionist and I am never quite sure if this is good or bad. Hence I will not do something if it cannot be done perfectly right. This is something I have applied to all exhibitions I have done until now and it is something I intend to keep doing for all future exhibitions and projects I might tackle. Planning the permanent exhibition for the BCEE started a couple of months ago in early July. 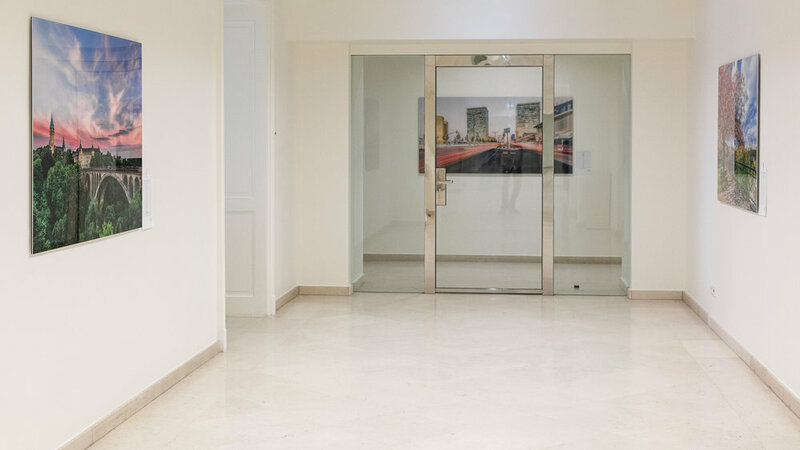 After several meetings a selection of 24 artworks in various sizes had been chosen by the BCEE to decorate an entire floor of the ARBED building. I will spare you the details of the logistics to get all the artworks ready in time. 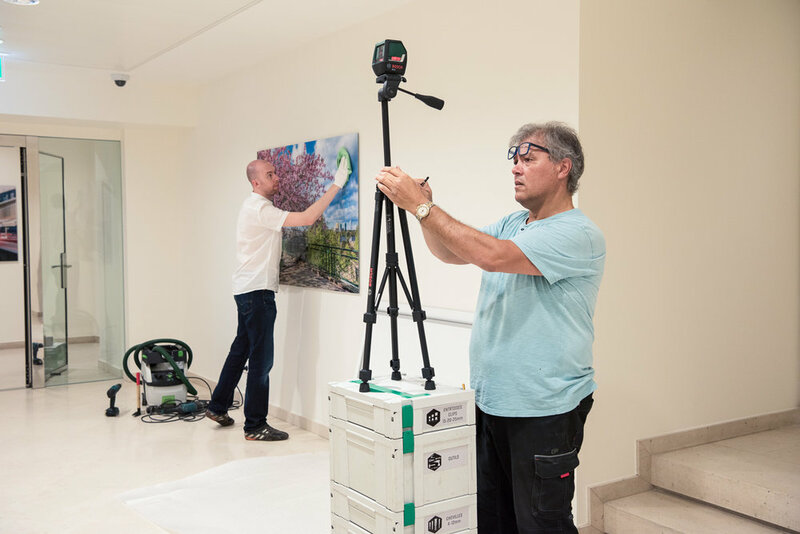 The setting up of the exhibition went very smoothly and was completed over the course of a day thanks to a very competent team of professionals. Most pictures that are part of this exhibition can be seen in my Gallery. Does your company also suffer from white walls? I would be happy to provide you with more information about my fine art prints and send you a free quote.